day 3103: odin shows off his lego millennium falcon. 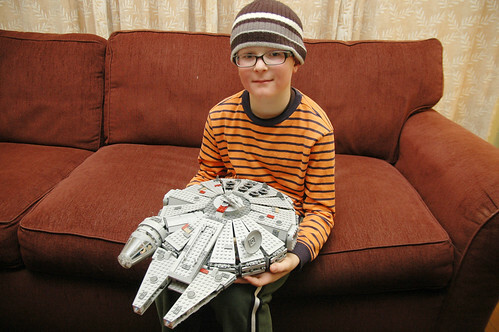 like a lot of kids his age odin loves lego and while he hasn’t seen the star wars movies, he somehow seems to know a lot about them and really likes the millennium falcon, so he was super excited to have gotten the lego ship as a gift for christmas from his grandparents. 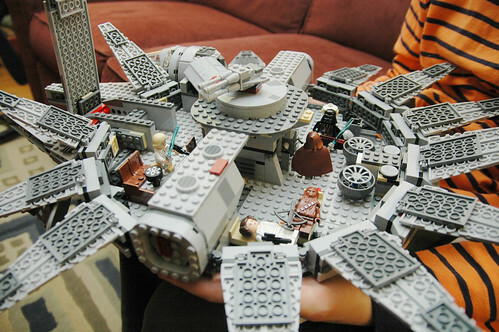 while it isn’t the 5,000 piece star wars ultimate collector’s millennium falcon ( which can be had for $3,000! ), it’s still a large 1,500 piece set and i thought it would take him a few days to put it together. in honor of putting together the grand ship, we decided to right a wrong and watched episode IV: a new hope so, you know, he could see the inside of the ship in the movie ( he loved the movie ). Previous Postodin talks with siri.Next Posta new year’s eve 13 miler with a new toy!